A Few Words About “kin” by Iamamiwhoami and Album Giveaway! click a song title to be taken to an elaborate review of the specific track. Their mystery ridden, complex story lines that have been presented through the project’s YouTube account have created a tight knit following through the digital-only BOUNTY and ; in concert releases. 21st century marketing, combined with technological outlets and creative expression that walk a tightrope between nimble accessibility and brilliant experimentation are just surface level scratching of what Jonna Lee and Claes Bjorklund have accomplished together. For two years, the electronic duo Iamamiwhoami have taken the internet and the international music scene by storm, causing a blindsided firestorm of acclaim from the blogosphere and MTV, even going so far as to receiving a 2011 Grammi award for Innovator of the Year. All this notoriety, and yet the project still did not have full release or proper judge of character behind the masks of the project. In fact, it seemed as though it would stay that way. In a recent interview, vocalist Jonna Lee proclaimed the two lone tracks released after the BOUNTY series, “; John” and “Clump” were created as an epilogue of sorts. While it was an ending, the songs were presented right before their first live concert and the only information we’d been given on behalf of the duo was that of which was streamlined through iTunes releases and YouTube videos. Many took it as the end of the musical venture as a whole and hope seemed to be severed. With the debut of kin, their first physically released album, the creative force has left their mark even further and continues to expand through these live shows and magazine interviews. What once was thought of as a project which came to a halt is now continuing at unstoppable speeds and kin proves the band worthy of doing so. kin is crafted through versatile means that dip through hints of downtempo, industrial, trip-hop, chillwave, and all around electro genres that are packaged together under an umbrella of pop composition and experimental production techniques. While the first few listens recall voices of pioneers within the alternative dance community, Iamamiwhoami brings creative drive through their approach to the mixing and recording process. Specifically speaking and most noted are the vocal approaches. The entirety of Iamamiwhoami’s discography has a precise vision in every aspect of its processes, but a strong focus on remaining fresh in terms of vocal production and recording is felt. Jonna Lee sings in a very different tone than her contemporaries and on top of that is heavily effected in reverberation and delay to create an extremely dense world, thick with emotion and euphoric bliss. Sonically, the record doesn’t have the largest dynamic range. It averages at about 6dB, but manages to give itself a very spacious vibe through smart use of equalization techniques. This is most touched upon on our track review of “Sever” but has also been mentioned elsewhere. In fact, the only place where kin seems to suffer from being too loud is from the minimal arrangement on “In Due Order” but upon listening to the album in it’s entirety, the track maintains the balance that the rest of the album has. Also, listening to the record on vinyl gives a vastly different listen, so we recommend to give that physical version a listen! All in all, kin is a deeply conceptual journey from start to end. A look at different aspects of the human psyche, all interwoven into a greater whole that’s able to effectively and elegantly portray these folk-esque stories through means of sing/dance in a way that’s new and refreshing in the world of 21st century music and technology. BUT WAIT! WE HAVE SOME DROPS FOR YOU! TO CELEBRATE THE RELEASE OF IAMAMIWHOAMI’S DEBUT ALBUM, WE’RE GIVING AWAY THREE COPIES OF THE STANDARD EDITION OF KIN! The standard edition of kin comes in a folded digipak and features both the album, as well as a DVD that features all of the videos released for the kin project! THERE ARE THREE GLORIOUS WAYS TO ENTER! Are you ready to Play..? First way to enter: Like us on Facebook and leave a comment on this article telling us your favorite Iamamiwhoami moment so far and/or your favorite song from kin! Third way to enter: Leave a comment on this post (make sure you enter a valid email address) letting us know your favorite Iamamiwhoami moment so far and/or your favorite lyric from the duo. One winner from each way to enter will be selected on October 21st, 2012 and will be contacted via email so we can gather shipping information and sever these copies from our office! What are you waiting for?! Be a good worker and give us your submission A.S.A.P. kin was released June 11th, 2012 via To Whom It My Concern & various September dates through Cooperative Music. This entry was posted in album review, Contests, Exclusives and tagged 2020k, album review, Claes Björklund, Giveaway, iamamiwhoami, Jonna Lee, kin. Bookmark the permalink. 30 Responses to A Few Words About “kin” by Iamamiwhoami and Album Giveaway! My favourite moment has to be watching the live stream of the first concert. In which she burnt a fan alive. It was crazy and I couldn’t take my eyes off the screen for the duration of the concert. Seeing her live a few days ago is tied as my favourite moment as well though! My favorite moment was the ; john release after 6 months of silence and my favorite lyrics are “May the god of me protect my soul, as I stay a little while longer, in this dusty rabbit hole, to sing my song chained on your bed”. My favorite Iamamiwhoami moment was the whole imaginary behind every video. I just love the woods, the dust-mosters, every single piece of Jonna like the armor made by building rubble. My favorite iamamiwhoami moment was waiting late at night one November waiting for the live concert and then seeing her do an online performance with remixes and extensions of some of my favorite songs from BOUNTY. My favorite lyric is “A pinion of labored men as capable as trust.”. That line just hits me for some reason, and I love the way she sings it. My favorite moment would be the live-streaming show, back in 2010. It was groundbreaking, beautiful and hypnotizing. I remember thinking how crazy it was that all the Iamamiwhoami fans were watching this at the same time and it was then that I felt like I was really part of a phenomenon. My favourite moment was definitely the desert scenery, because it was the place where I could actually imagine myself be metaphorically. The video of ‘rascal’ really defines my feelings the most, feelings that I have been feeling for a long time. It’s been a pleasure following your reviews of the kin tracks. I especially like your discussions about EQ, which have helped me unravel some of my own mixing mysteries. (If now I could only grok compression!). 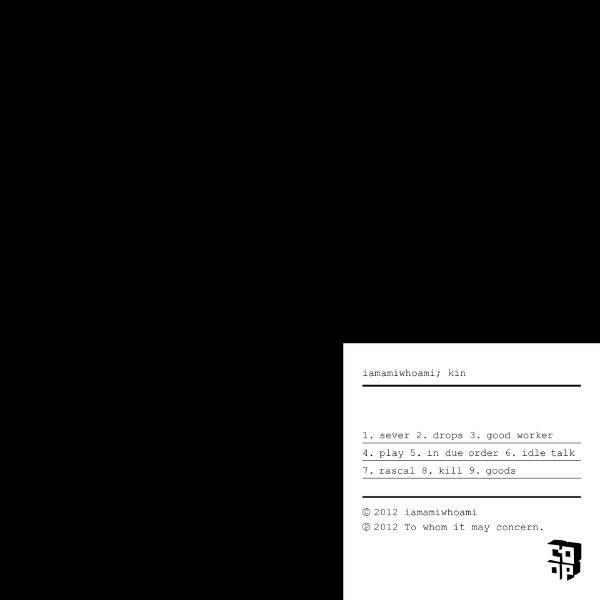 As far as my favorite iamamiwhoami moment: It changes every day! Sometimes I hear something new in a favorite song that I hadn’t noticed before, making it all the richer. Or a song that I may have felt lukewarm about suddenly comes into focus, the lightbulb goes on, and I start loving it. Not to mention listening to Unplugged70’s covers and realizing how very strong the songwriting actually is. At the moment, my favorite moment is listening to the XFM in-session tracks. Even though they are LQ and low bit-rate, they are nothing short of revelatory. I have a entirely new appreciation of one of the songs from kin because of that set. Ask me again tomorrow, and there will be a new favorite moment. My favorite moment would be the release of “sever” beacaue of it’s deep emotional meaning and the beginning of this wonderful sureal story which made me forget about our real world. It was a perfect moment of happiness. When I was a little boy, I used to dream with a wanderer woman with long, long white hair. When iam released ‘y’ I was amazed and kinda scared to watch something I used to dream. Jonna instantly became a muse to me since then. The lyrics of ‘y’ also meant something really deep and strong for me. A song of hope. And hope is all I have now. I cherish all the project with all my heart and I hope they continue delievering such incredible things. I love every track and every piece of imagery they create. iamamiwhoami is simply amazing. I’m really sorry. My english is the worst. Correcting: ‘wandering’ and ‘delivering’. Sorry! My favorite moment from the whole iamamiwhoami project is the In Concert. It’s a story wrapped up in mystery and darkness. It’s so hard to pick a favorite iamamiwhoami moment!!! like I’m so thorn…But I will play it safe and say my favorite iamamiwhoami is the t video, because I have been following iamamiwhoami (meaning tracking their every single move lol) the upload of the very first preludes, but the t video and song were the ones that sealed the deal for me, that’s when I knew I would be their die-hard fan forever (even if t shares the spot of my all-time favorite with b and good worker). And my favorite lyric, well it’s not really a lyric from one of their songs, but it is one of the phrases they used for the video that linked to the “in concert” stream (towhomitmayconcern.cc) “it is what it is”. it’s not their most unique line, but since the moment Jonna mouthed those words, they have stuck with me and I tend to use them a lot in my everyday life. Favourite moment – The video for “kill” was definitely one of my favourite moments. It was simply one of the most beautiful music videos I’ve ever seen. Jonna standing in the sea, and a single tear on her face. Gorgeous. Favourite moment: There are so many…but I love the part during IN CONCERT where Jonna appears in the hair dress and dances with SUTS. It’s just so magical and emotional and always gives me goosebumps. My favourite moment is release of “sever”. It was on Saint Valentain’s Day. I heard it on a first serious date with my current boyfriend. We kissed for the first time to this song. Since then “sever” is “our” song. We just came back from iamamiwhoami concert in Warsaw, Poland and it was great to hear this song live hugging my boyfriend. My favourite lyric is “Water fills her lungs and she’s inhaling, you feel better now” from the song t. I don’t really know why, I just like the powerful emotions that lies beneath those words. But yeah, I will never forget that moment. My favourite moment is my first contact with iamamiwhoami when i watch ” ; john ” video. I was so confused it was mystery. Next day i start enjoying rest of her songs and i fall in love with all that project. ,My favourite moment I think is when I discovered iamamiwhoami and I listened “Y” it was a overwhelming feeling, like a lullaby you know. then I download ‘bounty’ and ‘kin’ and I fell in love completely. Now I’m stuck with all her songs, I’m glad that she risked with this project. My favourite moment was the release of whole ‘kin’ series. The excitement every two weeks from knowing a new song and a new video. Follow the whole story from the beggining was fantastic. my favourite song is ‘n’ from bounty. this line gave me chills the first time I heard it and I think that the message in it is the truth. There were many amazing moments since I first kept contact with their imagery (after the ‘o’ release). Examples are the release of each “bounty” video. Indeed, all of the videos and songs are equally meaningful to me, but I guess the climax was the ; john video release. It was very hard to deal with the fact that, after an amazing live streaming of their first live concert (20101116), which ended in a very enigmatic way (even though we discovered the animals’ role in the videos) and made a huge fanbase make part of an individual’s journey led to a moment that made people think it was an end of the bounty series (which was an amazing experience to see how the videos were evolving and acquiring a history), and that the project would be certainly over. After 6 months of speculation and hard waiting, the music video released on may 15h made me feel so blissed and amazed of how incredible the song, the video and the lyrics were made, that I couldn’t even believe that she actually would come back and release many more videos. The symbolism of it is also beautiful, representing her leaving of purity and leading to reproduction matters, which gave life to what we have in our hands this year, the album kin. For me, ; john is one of the most important moments because is definitely a transition between the surrealism and symbolism of ‘bounty’ and the creative process/born of ‘kin’. that can truly once again make glasses themselves an `accessory`.